Less than a week after it began on November 8, the Campfire has become the deadliest and most destructive wildfire in California history, leaving more than 40 people dead and thousands without a home and belongings in Chico and Paradise. Sierra View is contributing to the relief effort by sending a truck to deliver supplies and materials to the affected areas. 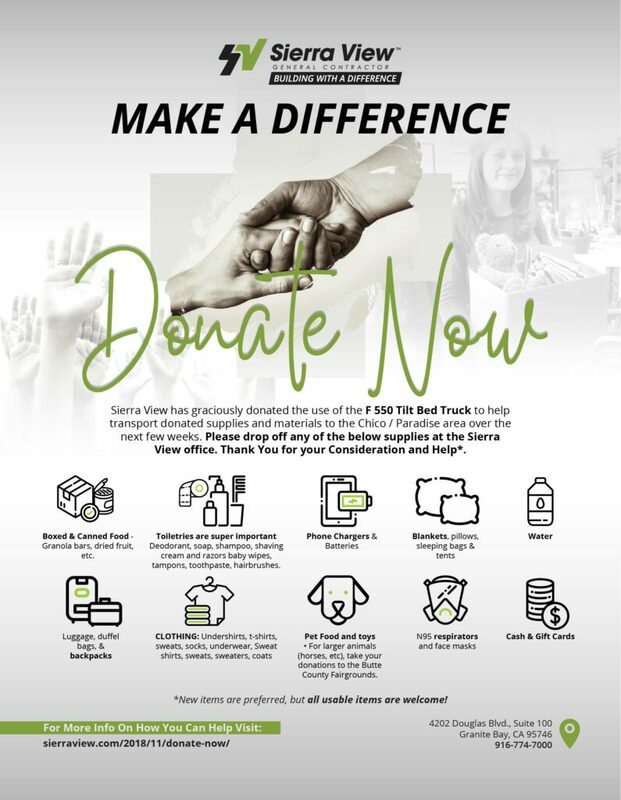 If you would like to donate clothing, food, toiletries, baby formula, diapers or household items you can drop them off at our office at 4202 Douglas Boulevard in Granite Bay. Our next shipment will take place this Friday morning, December 7. In the meantime, if you have questions, please contact Andy Brophy at 916-407-0547 or andy@sierraview.com.